This peak is #1 on the Height List for California . This peak is #1 in Prominence List for California .Mount Whitney is in the Sierra Nevada, and is the highest peak in the lower 48 states. It is located just above the Owens valley which is just east. The west slopes are mellow scree, while the east face is a massive rock cliff with numerous Class 5 routes. A trail on the south ridge leads to a stone cabin on the summit. The summit itself is a gently sloping surface, which has not yet been divided by erosion. Mt. 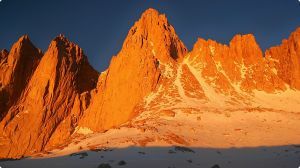 Whitney is the most frequently climbed peak in the Sierra Nevada. Viewpoint: Mt. Whitney cannot be seen from the west, because it is on the east side of the Great Western Divide, the chain of mountains that runs north/south through the center of Sequoia National Park, dividing the watersheds of the Kaweah River to the west and the Kern River to the east. Because many of the snowcapped peaks in the Great Western Divide reach altitudes of 12,000' (3657 meters) or higher, it is impossible to see over them to view Mt. Whitney from any of the roads on the west side of the Sierra. The best place from which to see Mt. Whitney is the Interagency Visitor Center on Highway 395, just south of the town of Lone Pine on the east side of the Sierra. Highway 395 can be reached via Tioga Pass in Yosemite National Park (open summer only), or by going around the southern end of the Sierra from the town of Bakersfield. There are no roads across the Sierra in Sequoia and Kings Canyon National Parks. Permits: The National Park Service and the US Forest Service, who manage the Whitney Portal Trailhead, have implemented a permit system to minimize the impact of day-hikers on the Mt. Whitney backcountry. All hikers entering the Mt. Whitney zone, including day-hikers, are required to obtain a permit. These permits are in great demand, so you have to reserve well in advance. The hike up Mount Whitney is a 34 km round trip with 1900 m of elevation gain from Whitney Portal. There are two places to camp on the trail. Outpost Camp is the lower of the two, while Trail Camp lies just below a long series of switchbacks up a steep face. The one-day hike up Mount Whitney is extremely strenuous: hikers are advised to be careful of altitude sickness. People also hike the trail in two, three, or four days, sleeping at the camps on the way to the summit. Climbing: The steep eastern side of the mountain offers a variety of climbing challenges. To the south of the main summit there are a series of minor summits that are completely inconspicuous from the west, but appear as a series of "needles" from the east. The routes on these include some of the finest big-wall climbing in the high Sierra. Two of the needles were named after participants in an 1880 scientific expedition to the mountain: the Keeler Needle and the Day Needle; the latter has now been renamed Crooks Peak after Hilda Crooks, who hiked up Mount Whitney every year until well into her nineties. Name Notes: Mount Whitney was named after Josiah Whitney, the chief geologist of California. The first ascent was in 1873 by Charles Begole, A. H. Johnson, and John Lucas, a fishermen who lived in Lone Pine, California.